The S&P 500 is set to end 2018 down nearly 7 percent. For the first time ever, the S&P 500 will end the year with a loss after being positive for the first three quarters. This volatile market year was full of historical milestones and the end of the year will be no different for a key stock index. For the first time ever, the S&P 500 will end the year with a loss after being positive for the first three quarters. The benchmark index was up 9 percent through the first three quarters of the year. Then the October sell-off began. 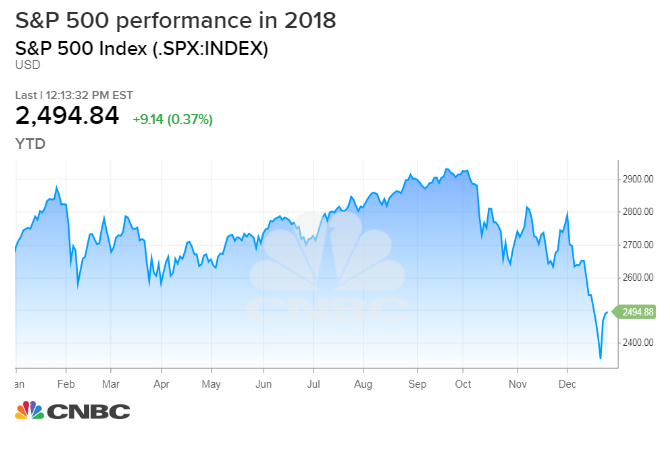 The S&P 500 fell 7 percent in October and accelerated those losses this month, in what is likely to be the index's worst December performance since the Great Depression. The S&P 500 is set to end 2018 down nearly 7 percent. The fourth-quarter sell-off flies in the face of history, as the last three months are typically the strongest time of the year for the markets.